Art has the ability to change people's way of thinking and it has the ability to unite us. In Moira Finucane's Dance Hall! 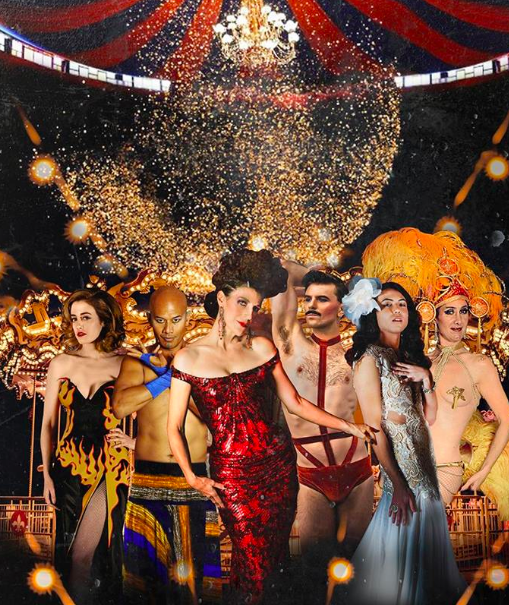 : The Diva Carousel, a number of Melbourne's finest talents come together to celebrate art and to inspire us to be better and do something good, particularly with the way the current Australian Government has been treating refugees, women and people from the LGBTQI community. While the show is a little tamer than you might come to expect from Moira Finucane, it is still a hugely entertaining evening with a mix of regular faces and new faces within the Finucane family. Maude Davey wins the crowd over with each one of her acts, including her puntastic turn as Earth. Her performance of The Angels' "Am I Ever Gonna See Your Face Again" is always a joy to watch and was clearly an audience favourite. James Welsby's highly energetic vogueing number is an empowering reminder for constant self-growth and self-exploration and learning to be comfortable in your own skin and never denying who you are. The singing and dancing continue throughout the night with Paul Cordeiro literally having people dancing in their chairs with some seated choreography to Tina Turner's "Nutbush City Limit". Chanteuse Clare St. Clare performs a gorgeous cover of Beyonce's "Halo" and counter-tenor diva Mama Alto hypnotises the audience during their performance of Des'ree's "Kissing You". In her Melbourne diva debut, Willow Sizer cranks out a commanding rendition of the Eagles' "Hotel California". Finucane's two extemporary addresses - based on single words form the audiences - shows us the masterful storyteller that she is, finding a passionate tale that connects with and speaks to every single person in the room. For those willing to splurge a little bit more on a ticket with the Full Luna experience, you have the unique opportunity for a post-show live art performance from Finucane as you walk through the Ghost Train at Luna Park. It truly is the icing on the cake of a wondrous evening by one of the most giving and generous people in the arts. You can't help but to be truly enamoured of the acts in Dance Hall!, especially as each one bonds you closer and closer to those around you. In the climatic finale, we are all encouraged to keep dancing with each other into the night and into the streets and to never stop dancing in the face of adversity or those who seek to do more harm than good. There is one indisputable fact that is learnt from seeing a show such as Dance Hall!, and that is that art does bring people together and it does create powerful communities who in turn can create positive changes in the world. Venue: Luna Park, 18 Lower Esplanade. St Kilda.